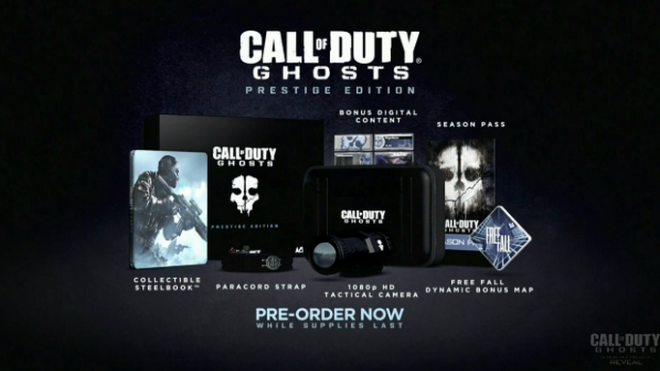 As with every almost every Call of Duty game since Modern Warfare 2, Activision has yet again announced both a Prestige and Hardened Edition for Infinity Ward’s upcoming Call of Duty: Ghosts. Both are packed with a ton of goodies, but only the Prestige Edition ships with a nifty 1080p HD Tactical Ghosts-themed Camera. Both are available for the Xbox 360, Xbox One, PlayStation 3, PlayStation 4 and PC. Now, check out the Tactical Camera in action! Call of Duty Ghosts is set to release November 5th for the Xbox 360, PS3, and PC. Next Gen release date is still TBA. Which edition of Call of Duty: Ghosts will you be picking up? I am an Gamer, Geek, Proud Husband, FPS Enthusiast, Battlefield Veteran, and Call of Duty Veteran, Proud Editor of MP1st, and I love all things gaming, I started out with old school games such as; Super Mario Bros and Donkey Kong Country. I now prefer RPG's, FPS's, Action & Adventure, and Racing Games.